Thanksgiving reminds me of the big family dinners we used to have at my great-grandmother's house. The table was loaded with all kinds of wonderful food, and I would stuff myself until I slid out of my chair and collapsed under the table. I always liked the Jello dessert my grandmother made. This year, I attempted to reproduce it. Drain the pears, saving the juice. After allowing the Jello to chill in the refrigerator for about 20 minutes (it should still be liquid), put it into the blender with 2 ounces cream cheese, and blend until thoroughly mixed and frothy. Pour the Jello/cream cheese mixture into a shallow dish. Mine was approximately 7 x 10 x 2 inches. The goal is to get a level that will be even with the pear halves. Next, arrange the pear halves, hollow side up, in the dish with the Jello. Put the dish into the refrigerator and allow it to chill until solid, about 2 hours (more if necessary). In a small mixing bowl, combine 3 ounces cream cheese with the sugar and walnuts. Form this mixture into balls and place them in the hollows of the pears. Keep covered in the refrigerator until serving time. The dessert looked cute and tasted great. Hubby said he would be happy to have more. I bought store brand pears, and found the quality inconsistent. Some were too firm and others too soft. A few were fragments instead of complete halves. Next time, I'll try a premium brand. Any red flavor Jello would be good with this, and orange would probably work, too. Save a few calories by making it with sugar-free Jello. Hazelnuts in place of walnuts would be great. Wouldn't these look great topped with maraschino cherries? 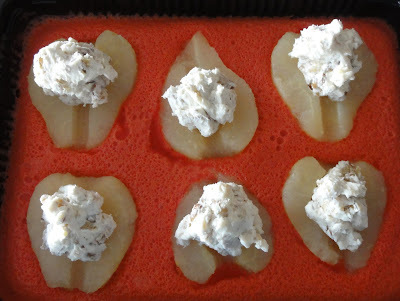 Another way to do this would be to use pear pieces instead of halves and stir them evenly into the Jello, then make a larger quantity of the cheese-nut topping and spread it as a top layer.